There are several key matchups that should dictate the direction of Saturday’s battle in College Station. 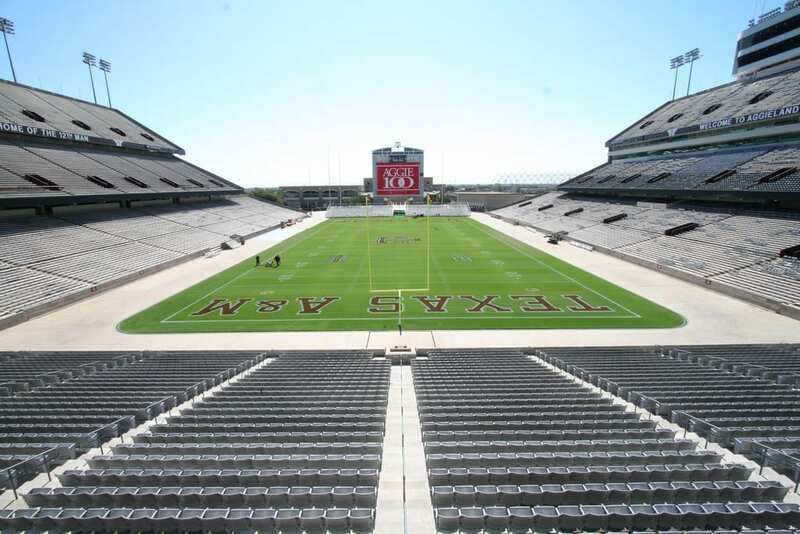 The "Aggie 100" logo at Kyle Field in 2006. Photo obtained from creativecommons.org, no changes made. The Tennessee Volunteers bring their undefeated record to College Station to face off against also-unbeaten Texas A&M on Saturday. There are several key individual matchups to watch in the SEC’s game of the week. Myles Garrett and Daeshon Hall are the most dynamic defensive end duo in college football. Garrett has been labeled as one of the best players in college football, and he shows why when he steps onto the field. On the flip side, Garrett has battled some injuries this season that has allowed Hall to gain some more exposure. Hall has recorded 22 solo tackles with three sacks on the season thus far. For the Aggies to have success, they will need both to bring pressure onto Josh Dobbs and force him to make some poor decisions. For Tennessee, it’s crucial that Chance Hall and Brett Kendrick contain Hall and Garrett. If they cannot establish a commanding presence up front, it may be a long day for Tennessee’s offense. Trevor Knight has been a revelation at quarterback for the Aggies so far this season, throwing for 1,261 yards and seven touchdowns. However, his ability to run may be his most dangerous asset as a quarterback. Against Arkansas, Knight ran for 157 yards to lead the Aggies, and Arkansas had no answer for his ability to break containment. The Vols’ linebackers had a tough time stopping the run against Georgia last Saturday against a pocket passer who did not run. Colton Jumper and Cortez McDowell may be second string linebackers, but they are going to have to get off blocks and contain Trevor Knight Saturday. If not, Texas A&M may run wild. Cameron Sutton’s injury has been a big one for the Vols. Sutton was one of the unquestioned leaders of the Tennessee defense when he went down. True freshman Baylen Buchanan has done a decent job so far filling in for Sutton; however, he has not faced the caliber of receivers that he will face this week. Texas A&M’s receiving corps is littered with future pros. Josh Reynolds, Christian Kirk, Speedy Noil and Ricky Seals-Jones are all going to have a chance to play on Sundays. They are the most talented receiving group in the conference — maybe in the country. The Aggies will test true freshman Buchanan early and often. No matter which guy lines up across from him, Buchanan needs to hold his own for the Vols’ to have a chance to slow the Aggies down. If he doesn’t, veteran quarterback Trevor Knight will pick on him all day.